Testing a pattern from Deepika Of Pattern Review? Oh yes, trying something new, sign me up. The tiled pages fit together easily, and is drafted in sizes from XS to 3X. Based on the measurements, I traced off the medium. My first muslin is from bargain bin remnants. The shoulders are usually an issue for me, but it fit perfectly. I just needed to take in the waist and decided to add about 3/4 of an inch to the length of the bodice, bringing it down to my natural waistline. I used some knit from my stash to do a second, partial muslin, to check the length of the bodice and sleeve. Initially, the pink was going be my test dress, then, thinking maybe a print would be fun I stopped into Haberman Fabrics and this was on a cart right at the front door. The bolt end piece hadn’t even been priced yet, but the cashier kindly pulled it out and priced it for me, at only $4.98 a yard. A dramatic border print at a bargain price. Karma? 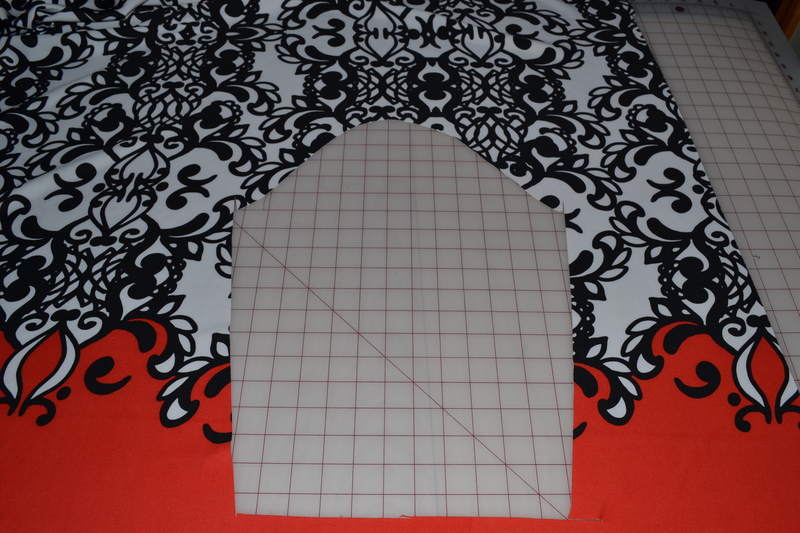 It took some time playing with the pattern placement to get the pieces cut out. When you look closely at the print, it’s not completely symmetrical. There is a drawn by hand appearance. The pattern calls for 2 yards, but to place the border at the waist and match up the print, I needed most of the 3 yard piece. 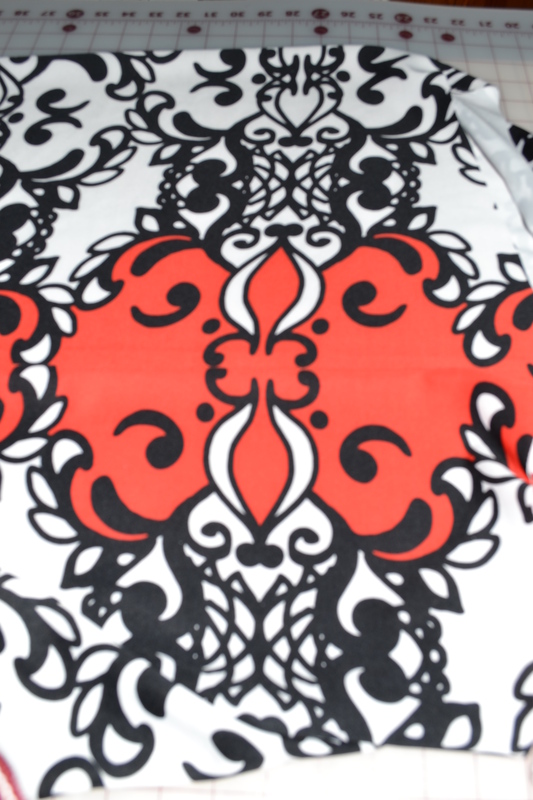 Keeping more red space between the black and white pattern made the lack symmetry look less obvious. 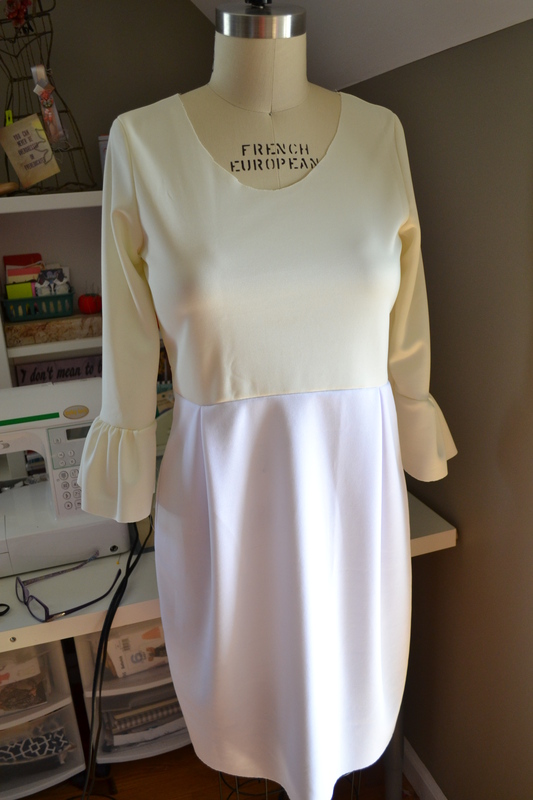 Because of the graphic pattern, I decided to eliminate the sleeve flounce and neck binding, using a facing instead. The directions include using clear elastic at the shoulders for support. This was the first time I used it, but won’t be the last, it’s great stuff. Since this is the Winter Street Dress, I found the last bit of snow, just outside the Ford Motor Test Track. 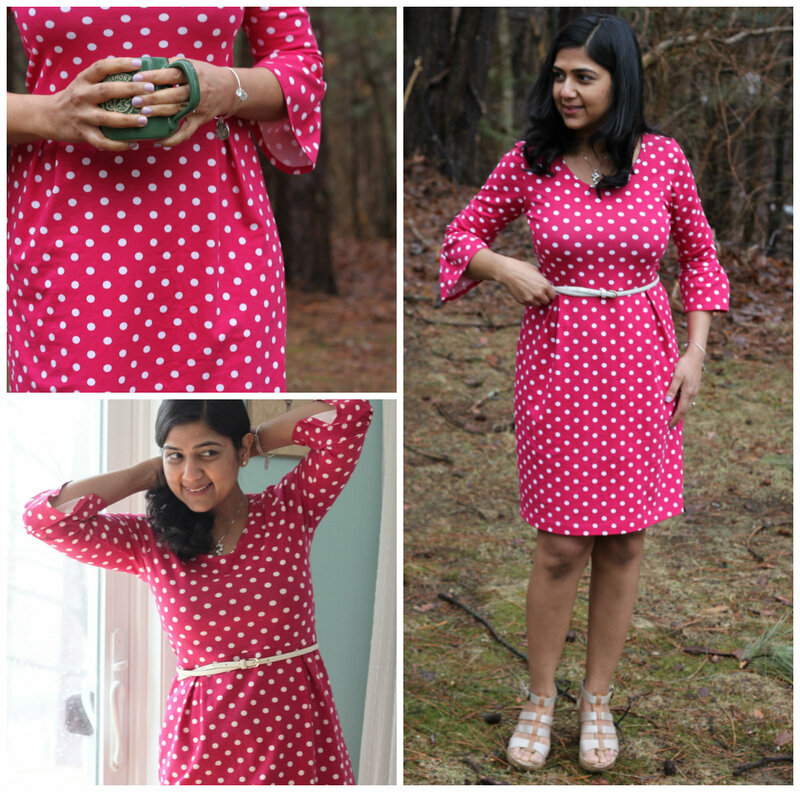 This dress is comfortable to wear and, even better, sews up so fast! Make it tonight, wear it tomorrow. Since I don’t own a serger, I used a stretch stich and then overcast the seams. Even doing that, it was a quick sew. 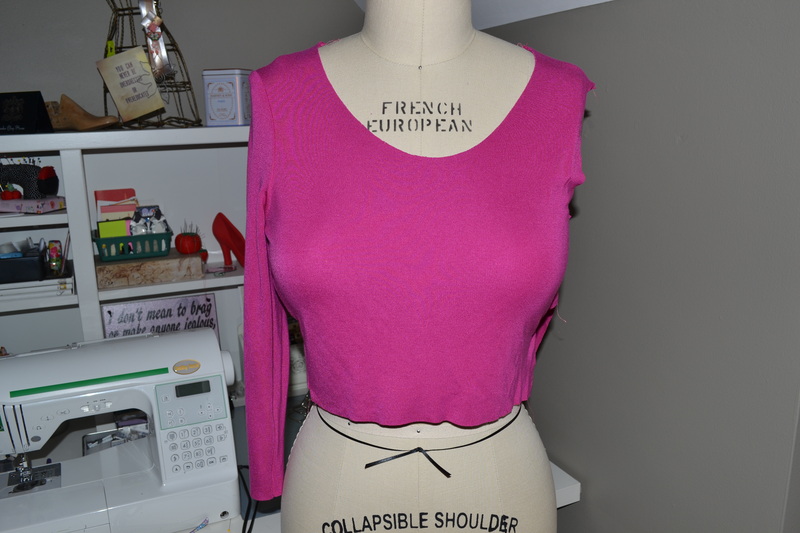 I plan to finish the pink with the flounce sleeve and do a sleeveless version for summer, maybe both in the same day. 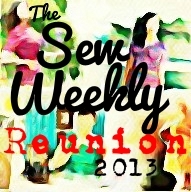 Check out the rest of the blog tour. 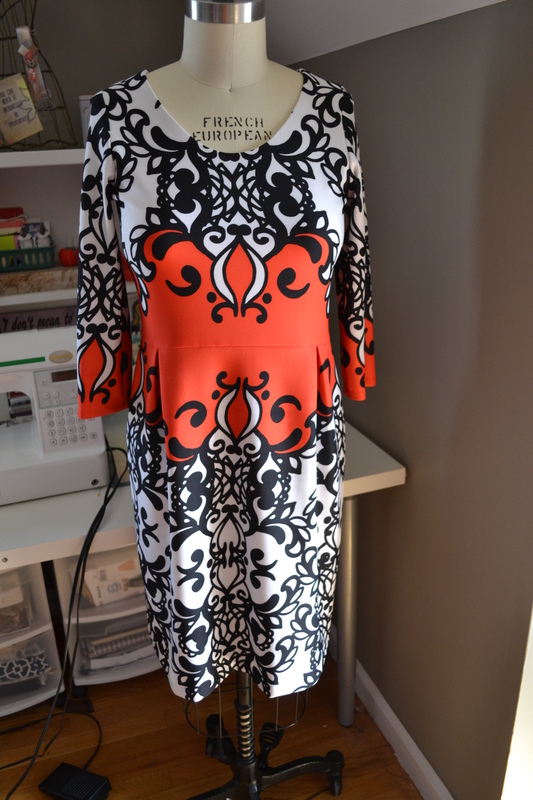 You fabric is amazing and the pattern placement is droolworthy. Your’s is my favourite so far!! Wow, thanks. It was pure luck to come across that fabric. Oh my gosh! This is fantastic! 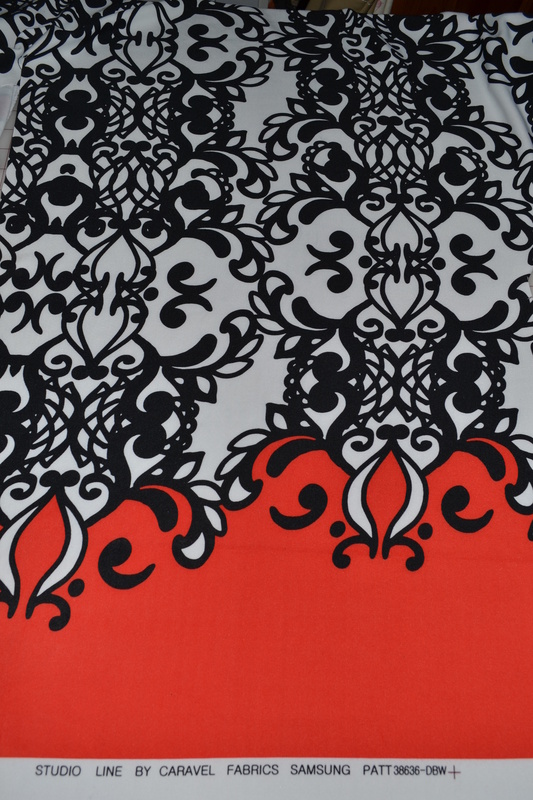 I love the placement of the fabric’s pattern… and what a great fabric. It’s really beautiful on you, too! Thank you, I’m already on the lookout for more border prints to play with. It was fun. Your version looks wonderful on you! What a great way to use a border print! I love your version as well!! It is stunning, and the fit is really good! Thank you. I usually have to fiddle with fit a lot, but not with this pattern. What a fantastic way to use the border print and you placed it perfectly. The pop of red makes your version so interesting, I love it! I like your version the best. All the time you spent lining up that border print and the extra money spent on more yardage was well worth it. Beautiful dress! Thanks so much, I’m so glad I found such unique fabric. Pingback: Pattern Review Winter Street Dress…Styled for Spring! Thank you, I’m on the short side and it’s the first time I didn’t have to make petite adjustments. What a fabulous dress. The fit looks perfect, too. I like your dress the best from the contest. It looks great on you. The bold print and your body shape truly rock that dress! Congratulations! Thank you. Testing the pattern got me to try something bolder than normal. Thank you, that fabric was a rare find.